EVE Blog Banter #12: Tying the dots and locking me in! Welcome to the twelfth installment of the EVE Blog Banter, the monthly EVE Online blogging extravaganza created by CrazyKinux. The EVE Blog Banter involves an enthusiastic group of gaming bloggers, a common topic within the realm of EVE Online, and a week to post articles pertaining to the said topic. The resulting articles can either be short or quite extensive, either funny or dead serious, but are always a great fun to read! Any questions about the EVE Blog Banter should be directed here. 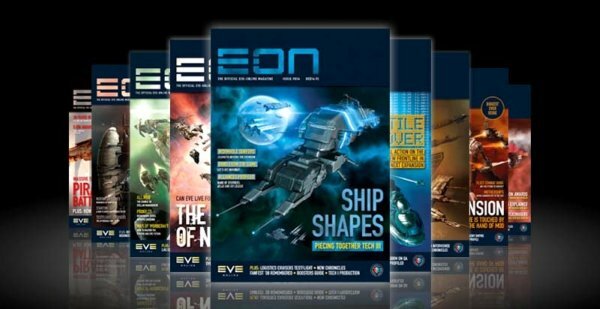 Check out other EVE Blog Banter articles at the bottom of this post! This month's banter comes to us from none other than me, myself and I, and I ask the following: First there was the MMO on the PC, and now with the recent announcement of DUST 514, EVE will soon be moving onto consoles. But what about mobile? Allow your imagination to run wild for a second and describe how you would see EVE being ported to mobile devices, whether the iPhone/iPod touch, Blackberrys or Android-based devices. Dream the impossible for us! 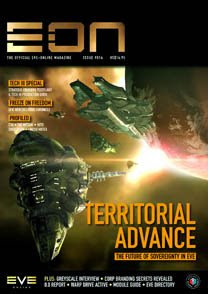 I've been dreaming of EVE Online on a mobile device since reading about it in the very first issue of EON. I've even made a few posts on this several times in the past, even going as far as teasing you about EVE actually running on an iPhone. That got a few folks excited as well as some others pissed! Oh well! But realistically speaking, the day when the full fledged EVE client will be running on an iPhone, Blackberry or other smart phones will never come to pass, and that's a good thing. When I came up with the idea of this banter, I wanted to come up with an EVE-based game and tell you all about it. Then I started thinking about ALL the mobile games I'd like to see, and the list was too long to even consider writing a single post on it. Then I thought about DUST 514, and how the game will impact EVE the MMO. And that got me thinking. Why not create mobile games that are all connected to each other. Where you've got one single login for all of them and an achievement in one game, opens up a new level in an other, or a new feature, or new gear. Say for example you complete a mission in EVE the MMO, and when you get back to the agent, she gives you a piece of "secret code" that you input in one of these EVE Mobile games. This in turns opens up a level in that game, one you wouldn't normally have access to by just playing the game. Take this to the next level and you can see how all these games including the MMO, the console FPS could all be inter-connected. This way, when I'm commuting to work, I could still achieve things in my favorite Internet Spaceship Universe. Have I lost it? Let me know your thoughts. This is a guest post by Kirith Kodachi from Inner Sanctum of the Ninveah. You can follow him @kirithkodachi. Minmatar ships tend to be odd birds. Besides the use of projectile weaponry, they tend to be all over the map in terms of other major systems. Some make use of missiles, others add in drones. Some are natural armour tankers, others better with shields, and some can go either way depending on the setup. The downside of this is that you need a lot of varied skills trained well in order to handle the Minmatar lineup; the upside is that once you have those skills you have access to a flexible and powerful fleet. I'm going to look at two Tech 1 Minmatar Frigates, the Rifter and the Breacher, and discuss some basic setups. Often overlooked, the Breacher is one of the few Minmatar ships dedicated to missiles and as such can be thought of as a Minmatar version of the Caldari Kestrel. While it only has four missile launcher hardpoints, it is a lot faster with smaller signature radius and higher scan resolution for faster locking. Taking advantage of those strengths is easy. This fast little ship can harry opponents up to 40 km away and fly over 1100 m/s without overheating and without the huge signature increase from a MWD. Not a bad setup for level 1 mission running should you want to avoid getting too close to the NPCs. It takes a lot of practice to balance the capacitor using modules and make sure you don't run dry at the wrong moment, but once that skill is mastered you can take on a lot of ship types and be confident of coming out on top. The numerous named modules is to save on CPU. The Rifter is actually decent at level 1 missions and frigate belt ratting as well. While the armour tank will work adequately in that scenario, the Rifter is one of those ships that can choose to shield tank in a pinch. You're going over 1200 m/s and the shield booster can keep you alive in those situations where you bit off more than you can chew. Your DPS is surprising with the Gyrostabilizers and big 200mm calibre weapons. Fly in, orbit tight, kill target, hit the next one. If things get too hot, boot it out of there with your afterburner and shield booster blazing. Now, there is a world of options between the first and second setups. Passive armour tanks, bigger guns, energy neutralizers, afterburner versus MWD, the list is damn near endless. Hence why the Rifter is well liked by pod pilots. With the recent demise of the GameScribe platform and the few hundreds or so blogs that had been specifically created for the contest, the EVE Blogroll lost a few hundred blogs or so. Which was very predictable when you understand the time, dedication and effort it takes to keep a blog going. Despite this inevitable loss, I'm happy to report that since then, I've received 50 [make that 51 with Finders & Keepers"] new blog submissions through comments and emails. Here below are all the new blogs that will soon be added to the EVE Blogroll. Though some of these blogs are now a bit outdated, I'm still posting them here so that this may excite their authors into more posts! You've all been teased! Screamer - A Pirate's blog, from the beginning. Welcome to you all! Safe travels and happy blogging! Friday Video: Halo 3 ODST - VicDoc "Terra Incognita"
The Halo franchise will forever have a special place for me. It's the game that got me onto consoles, it truly the first game where time became irrelevant, where I could not know if I'd been playing for 20 minutes, an hour or even 10. Halo 3 ODST, looks to be such a game as well. Looking forward to it! Can't wait to start exploring New Mombosa! The last game I played that was cel-shaded was Robotech. And though I was a huge fan of the anime, the game wasn't all what I expected it to be. Borderlands is a completely different kind of game, and seems very much what I'm looking for in a shooter these days! Looks like October will see me busy shooting things up both spaceside and planetside! This is going to sound like a record skipping, but I've been late, really late that is, in posting the Table of Content for the latest issue of EON. It's nothing to do with my enthusiasm for this fine piece of mashed-up tree pulp and chemical stains. Au contraire. I again have to blame this game called First Life. Seems the arrival of a RL clone once again has disrupted my current daily schedule. Add to that the fact that I had to rebuild my PC, and recently lost my broadband connection, and we can start to imagine that the folks on Olympus have promised to make my life difficult. But rest assured, I am starting to get control back. Slowly but surely, things are being worked out. The new PC is built. My phone/digitalTV/broadband provider, Bell Canada, is sending two of its technician tomorrow to get us back on track. I can see the light at the end of the wormhole! More Mass Effect 2 awesomeness! New to the EVE Blog Pack - Did you really want in? Nothing gets me more excited these days than a well put together EVE blog. Seriously! OK, maybe DUST 514 and Ambulation/Walking in Station/Incarna (or whatever they'll be calling it next) does a bit more. But there's something about getting a group of EVE Bloggers together, to work on their blogs, comment on each others articles and participate in interesting, and sometimes volatile arguments. It was the idea behind the EVE Blog Pack when I first had the idea way back in June of last year, and it still is. With the recent explosion of new EVE blogs, it was time to clean up the pack, remove the outdated blogs and welcome a few new members. When I mentioned my desire to do so in mid-August, I expected a good turnout, but nothing like I received. Picking and choosing those blogs that made it in the pack, and those who did not, was a lot harder than I thought it would be. I've realized that we've got some goddam good writers in the EVE Blogging Community, and the Pack is just the tip of the iceberg. As such, I'd like to welcome the 19 blogs below to the Pack (see the full listing of the EVE Blog Pack members). These new members are now part of an elite team of EVE Bloggers, and have an opportunity to be in the spotlight of our little corner of the Intertubes. Lets hope they use this opportunity wisely, and remember the responsibilities that come with the membership. Visit the EVE Blog Pack to see the full list of 40 blogs that are part of the Pack today. Over the lifetime of the Pack, some blogs have come and gone, but all have had an influence on the Pack to some extent. Some still do. Because of this, I've chosen to give you the list of these so that you may pay them a visit. Blog regularly about EVE Online, a few times a week preferably, but at least once. Add each member's blog to your Delicious, BlinkList, Reddit, StumbleUpon and/orTechnorati accounts. Now go forth, multiply and blog. That is your prerogative!